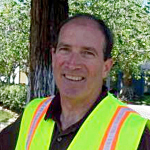 Gordon Mann has over 34 years of experience in municipal tree management, public administration, and urban forest management – including serving as the Public Works Superintendent for Redwood City (California). Mr. Mann’s role in Redwood City included developing and overseeing the city’s sidewalks repair program and as City Arborist integrating the City’s tree program with other departments such as planning, building, and engineering. His Right-of-Way maintenance division coordinated the tree maintenance with the sidewalk, streets, and traffic signal maintenance. In his career, he also served as the Urban Forest Services Director for the nonprofit Sacramento Tree Foundation (California), Tree Maintenance Supervisor in San Mateo (California) Parks department, and the Village Forester in Brookfield (Illinois) Public Works department. Gordon has made presentations for many groups ranging from private companies, cities, public works superintendents (MSA and NPDES) to arborists (ISA, ASCA, SMA, WCISA, PNWISA, TXISA) and engineers (APWA) on different aspects of tree care, pavement and sidewalk management, and urban forestry. He is an ISA Certified Arborist and Municipal Specialist, an ASCA Registered Consulting Arborist, a PNW Certified Tree Risk Assessor, a CaUFC Certified Urban Forester, and a volunteer national ski patroller. In 1986, Mann Made Resources was founded to provide consulting services and products to clients who appreciate the value and importance of trees. The company has been built on the philosophy that trees are essential urban infrastructure and necessary for a high quality of life in urban areas. Decisions on trees should be made on the consideration of tree health and risk, and the time investment required to receive the many benefits trees provide, such as shade, storm water interception, improved air quality, and natural features for a community. Gordon received a B.S. degree in Forest Science from the University of Illinois, and has attended community college horticulture classes, continuing education classes to maintain his certifications and continues to remain abreast of new information. He graduated from the Dale Carnegie course, and received Toastmasters Bronze Advanced Communication. Mr. Mann is currently a director on the Boards of the American Society of Consulting Arborists and the California Urban Forests Council.